I met with 12 members of the Urayasu Friendship Doll Exchange Association on November 26 for lunch at the Oriental Hotel in Urayasu City. 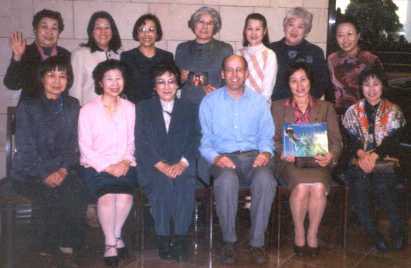 This group started its activities in 1995, and since then the members have made about 20 dolls by hand and given them to elementary and junior high schools in America and Canada. Most of the dolls have gone to schools in and around Orlando, Florida, the sister city of Urayasu. Japan's Disneyland is located in Urayasu, so it is natural for Urayasu to be a sister city with Orlando, the home of Disney World. The members of the Urayasu Friendship Doll Exchange Association were quite happy to tell me about their activities. They make by hand the dolls given to schools, and a small group of members will usually travel to the schools in order to give the dolls to the children in person. They had planned a trip to visit Florida schools in December of this year, but they reluctantly decided to postpone it because of the recent terrorist incidents. The members work together to make one doll. Some people make the face, hands, feet, and body. Others sew the kimono and the jiban (underwear for the kimono). Another person will work on the obi (belt for the kimono). Still others will make by hand such items as the doll's passport, otedama (Japanese-style beanbags), hairbrush, and stand. Members and other Urayasu citizens contribute silk kimonos to be used in making the doll kimonos. Other individuals and groups provide financial support for the Urayasu Friendship Doll Exchange Association. 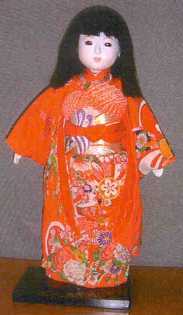 Some people have much experience and talent that they use in making the doll's kimono, face, or hair, while other members learn skills from the more experienced members as they together make a new doll. The making of one doll to be sent to an overseas school is truly an excellent example of teamwork among many individuals. During the luncheon meeting I met one woman from Yamagata Prefecture and another woman from Miyagi Prefecture. They both were very excited to see photos of the Japanese Friendship Dolls named after those prefectures. My brother had visited the Maine State Museum this past summer and took some photos of Miss Yamagata, so the woman from Yamagata was quite happy when I gave her a couple of copies. I only had a digital copy of the Miss Miyagi photo, but I promised to send a printed photo copy to the woman from Miyagi as soon as I could get one from the owner of this doll. I showed the group some photos and other items from my visits to 13 Japanese schools in the previous three weeks. 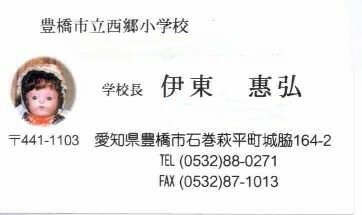 The members seemed most excited when I showed them the business card of the principal of Saigo Elementary School in Toyohashi City. His business card has a photo of the school's doll named Koneta. Several women wanted to try to make a similar business card with a photo of one or two of the dolls made by the group. We exchanged some materials related to the Friendship Dolls. The group gave me a pamphlet published for its five-year anniversary. This pamphlet contained photos of the Japanese dolls sent to other countries, photos of the dolls received in Japan as a return present, information on each of the dolls, and a section where each of the members wrote what the group meant to them. The members also gave me several cute handmade items. One woman showed me handmade hina dolls constructed from clam shells. She said she grew up in a poor family, so these were the types of dolls she had as a child. November 26 was my last day in Japan, so I brought my luggage with me so I could go directly from the Oriental Hotel in Urayasu to Narita Airport. I started out to Urayasu about 8 a.m. from Kawasaki, a large city next to Tokyo. When I looked at the packed trains headed toward Tokyo's Shinjuku Station, Japan's busiest train station, I realized it was going to be a very, very difficult journey with all of my luggage. After waiting in line for a few minutes, I boarded a train. More and more (and even more) people pushed into the train car, and I felt like I was going to be crushed as I stood (at a tilt), but somehow I managed to keep my bags more or less around me. The best moment of my three-week stay in Japan was when this 30-minute train trip ended. During this short train trip I learned the true meaning of the Japanese word sushizume ("packed together like sushi," which means "packed together like sardines"). Also, I now understand why many Japanese people use a delivery company to send their bags to the airport rather than trying to carry them in the trains.